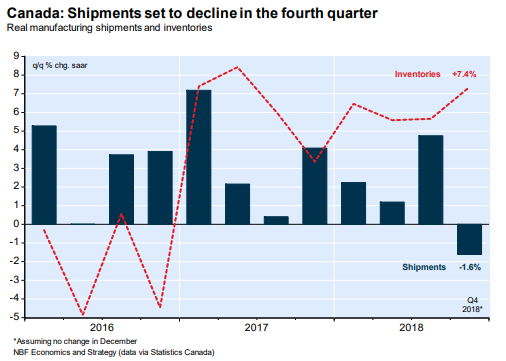 “Canadian manufacturing shipments came in below expectations in November as sales fell for the first time in three months in the petroleum and coal products segment. Lower production due to maintenance and other work at refineries, combined with lower prices for these products, led to the largest one month decline in over 3 years. 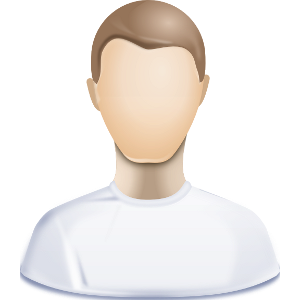 This was reflected on a provincial basis with Alberta posting the biggest one month fall since the oil price slump of 2015”. 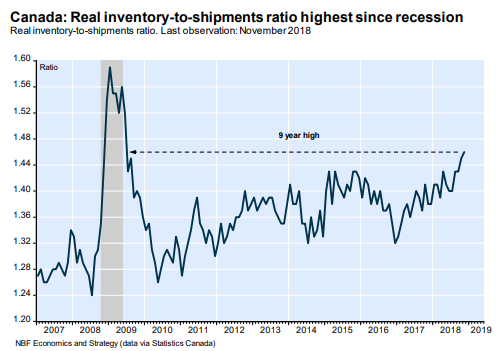 One of the indicators suggesting that the Canadian economy is facing severe headwinds is the huge build-up of manufacturing inventories late last year. In fact, Canada’s manufacturing inventory to sales ratio has been climbing for three years and reached an eight-year high in November. Although final data for 2018 are not yet available. manufacturing shipments (or sales) declined 1.4% in November to $57.3 billion in Canadian dollars. Sales in November were also down in 13 of the 21 broad industries including petroleum and coal products (-13.8%), chemicals (-2.1%) and paper manufacturing (-2.3%). At a provincial level, manufacturing shipments fell heavily in Alberta (6.8%), no doubt related to difficulties in the petroleum industry. When the of manufacturing figures are adjusted for price changes, the volume of sales declined by nearly 1% in November while inventories were essentially flat. As a result, the real inventory-to-sales ratio rose to its highest level since the last recession.